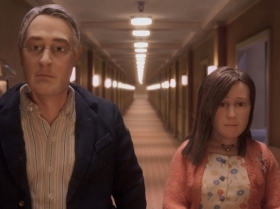 From the mind of Charlie Kaufman (Being John Malkovich, Adaptation, Eternal Sunshine of the Spotless Mind) comes a tender, touching and funny black-comedy, filmed entirely in breathtaking stop-motion animation. Michael Stone, a husband, father and successful motivational speaker, is crippled by his mundane life. A chance meeting with Lisa, an unassuming baked goods sales rep from Akron, Ohio, throws the dullness into disarray and Michael feels he may have just met someone who can make a change.